Vaseline Instant Fair Lotion is the newest member of Vaseline’s extensive line of products. It is an instant whitening lotion that allows for fairer and even-toned skin in just one application. Vaseline is able to ensure the effectiveness of their product not only because of the careful research, and testing that all Vaseline products go through, but also because Vaseline knows their consumers’ skin best. The main ingredients to the success of this product are Microreflectors that allow for instant fairer skin. Vaseline Instant Fair Lotion also has the renowned Vitamin B3 that give long term and healthy whitening and has triple sunscreens for protection against the sun’s harmful UVA and UVB rays. 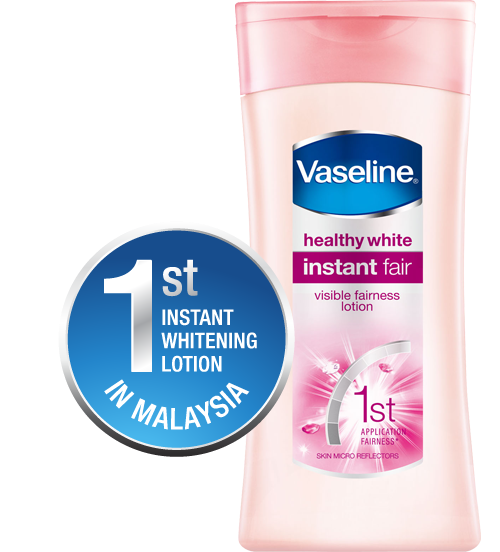 To be eligible to receive a free 20ml sample of Vaseline Healthy White Instant Fair, Participants are required to complete their details accurately in the digital form provided. Sample stock is limited and will be given out on a first-come, first-serve basis. In the event that the Organiser runs out of stock, no compensation or replacement will be given to the Participant. The Organiser will send out the samples some time during or after the campaign ends according to the posting address given by the Participant. In the event that the samples fail to be delivered or returned to the Organiser, the Organiser reserves the right to either send it again or not according to its full discretion. The Organiser accepts no responsibility for samples lost, damaged, delayed in the post, or due to computer, IT or any technological error.